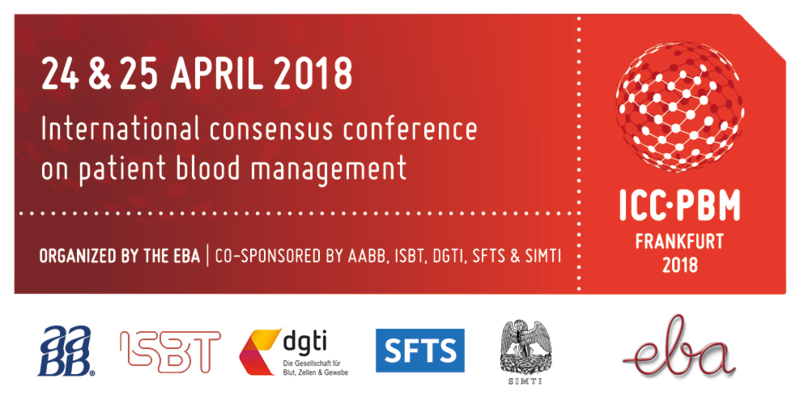 On 24 and 25 April 2018 the International Consensus Conference on Patient Blood Management (ICC-PBM2018) took place in Frankfurt, Germany. At this event, international experts presented evidence summaries to a multi-disciplinary panel and an audience of over 250 stakeholders, consolidating the available knowledge and concluding on recommendations. The Centre for Evidence-Based Practice (CEBaP) of the Belgian Red Cross followed a rigorous scientific process by systematically reviewing the available PBM literature, condensing these into evidence summaries using the GRADE Approach to assess the quality of the evidence. The Scientific Committee members oversaw the work and checked all the summaries. Education, Implementation and Maintenance of PBM. 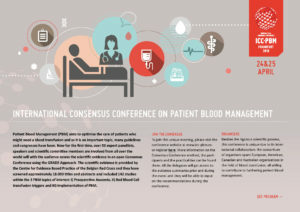 Besides the rigorous and transparent scientific process, this conference is unique due to its international collaboration: the consortium of organisers spans European, American, Canadian and Australian organizations in the field of blood transfusion, all willing to contribute to furthering patient blood management. The Centre for Evidence Based Practice (CEBaP) presented the use of the GRADE methodology for Consensus Conference use at the G-I-N Conference (Guidelines International Network). The delegation reported on their conference on the CEBaP website. if you want to be kept informed about the follow-up and future conferences, please contact the Conference Secretariat.